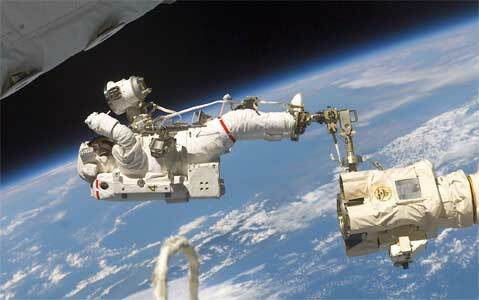 This Astronaut is in space, 350 kms above the earth. We can see the curved earth below. The thin blue haze on the horizon is actually our atmosphere. From up here, it is visible. The main atmosphere is about 35 kms thick, although it does thin out to well over 160 kms. Air has weight, and it is the force of gravity which holds the atmosphere to the earth. It is only within that thin layer that we can breathe, or fly. The air is our precious life support, and it supports our flying machines.